If you are planning to build an innovative new cloud service which can beat Amazon EC2 or Windows Azure, you must provide flexible VPN function around Virtual Machines. 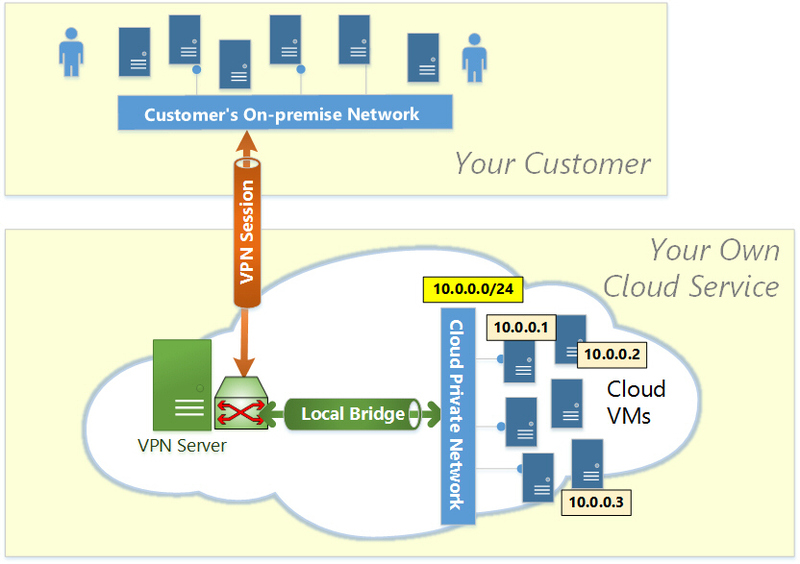 Amazon EC2 or Windows Azure has recently started IPsec-based VPN services. If you provides more sophisticated VPN for your new cloud services, your potential customers will be attracted on your new cloud services. SoftEther VPN is a suitable tool for building both your own Public Cloud Service and your Private Cloud Service. As described on "VPN for Cloud" , you can exploit SoftEther VPN's flexibility and ability to connect between user's on-premise computers and cloud VMs. Unlike legacy IPsec-based VPN, SoftEther VPN has advantages such as easy-configuration and L2-based simple-architecture. SoftEther VPN can extend layer-2 Ethernet-based network from the on-premise network to cloud network. Utilize SoftEther VPN to build-up the network stack of your new innovative Cloud Service which can beat Amazon EC2 and Windows Azure.